These versatile retro oil drums can be used as stools, footstools, chairs or storage bins. Coming in a nest of 3 sizes, the oil drums are made from tin plate and are finished with comfortable padded lids and convenient rope handles. 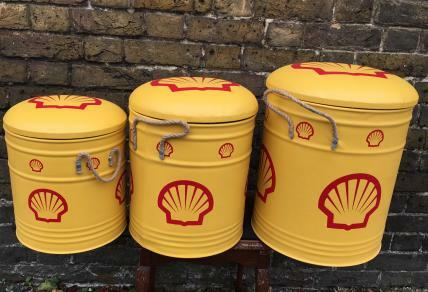 These storage stools have a yellow painted finish, accompanied by the iconic vintage Shell branding. Perfect for garages, workshops, man-caves, offices - or anywhere in need of some vintage automotive character.